Eco Friendly Homes – How do they Differ? Energy efficiency, eco-credentials and sustainability are all terms used these days, but what does it actually mean. Many volume house builders boast about their homes being energy efficient or having eco credentials, but invariably such claims fail to stand up to scrutiny when you scratch beneath the surface. An example of this is the increased use of Air Source Heat Pumps (ASHP’s). Whilst they are to be congratulated for taking this step, it is rarely taken for the right reason (ie it is usually because there are not adequate gas supplies in an area to allow traditional boiler solutions!). Some builders also tend to use heat pumps without investing in improved building fabric, limiting the commercial value of this technology to their customers. One example of an eco home builder is Eskgrove Homes. Eskgrove company philosophy is that their homes are sustainable along with being comfortable, healthy, easy to maintain and operate with as low a running cost as possible. One of the main difference with Eskgrove homes is the way they are constructed. The majority of new homes are built using timber frame, which means that most of the kit is built on site and no matter how efficient the builders are, there are inevitably minuscule spaces that air can escape from. However, Eskgrove Homes are one of a few companies in the UK to have developed timber frame systems to another level, into what is termed “closed panel construction”. This methodology sees the walls of each house virtually finished in the factory. For their homes at Pitlochry, this means the insulation, service conduits and internal plasterboard are all assembled with the studs into complete panels and delivered to site. This method of construction allows each home to achieve an exceptionally high standard of air tightness. Put in its simplest of terms, if you try to heat a home which has lots of tiny air spaces, some of that heat escapes through these spaces. If you want to keep that home at a constant warm temperature, you have to keep putting more and more heat into it, to compensate for what you are losing through the spaces. If your home is better made and has less spaces for warm air to escape, once you’ve heated it up, it will stay warm. After a while a small amount of that heat will of course leak out but it doesn’t take a big effort to replace it and get you back up to temperature. With Eskgrove homes, it’s not just one eco-friendly features that’s included, it’s a whole package of them. The factory manufacture, the precisely engineered components, the detailing for air-tightness and the air source heat pump. They can also add in additional eco-friendly features such as underfloor heating and mechanical ventilation with heat recovery. These are all parts of an interwoven and interdependent system, creating better, more sustainable homes. Edinburgh based property developer Eskgrove Homes has launched their latest development, Ballenlochan, in Pitlochry. The development of 10 bungalows has 2 property types – the 2 bedroom Moulin and the 3 bedroom Kincraig. By combining exceptional materials and simple, elegant design, these homes offer an outstanding, modern living environment. Since launching in 2008 Eskgrove Homes continue to stand out in the new build market, not just in terms of methods and materials, but also in terms of how they focus on the build and design. An Eskgrove home is not simply good looking and luxurious, it’s also designed to reduce environmental impact and the home owner’s fuel bills. To understand what is unique about an Eskgrove home, you have to go back to the start of the build process and how it’s different from other new build homes. Each home is built using a closed panel timber frame system, rather than basic timber frames. The closed panel timber systems are structurally and thermally engineered to Eskgrove’s exacting standards and requirements, delivering outstanding thermal performance. Each wall panel is factory manufactured, in Scotland, and delivered to site complete with external cladding, insulation, plasterboard and even the doors and windows fitted! All materials are very carefully sourced and combined with the precision of their assembly under factory conditions, the result is more accurately built homes than offered by traditional means. Eskgrove’s build process is highly engineered to give home owners a super insulated, energy efficient home of unrivalled build quality! Along with the energy efficient building system, each home is heated using an air source heat pump making it efficient to run and the extra insulation and air tightness of the exterior walls and roof in each home means that the heat stays within your property, further reducing your heating bills. The extra insulation isn’t just in the external walls to ensure heat doesn’t escape; it’s also in the internal partitions throughout the house, making them denser and more acoustically insulated ensuring you have peace and quiet in every room. Along with all these eco features as standard, Eskgrove have also concentrated on the design and elegance of their homes. External materials include clay roof tiles, proprietary render and natural timber cladding. This theme of elegant simplicity continues in the interior of the properties starting with the ceiling heights of at least 2.7 metres which immediately add to the overall sense of spaciousness. This is further enhanced by a striking open concept with a spacious living room, dining area, sun area and kitchen. Bedrooms and bathrooms have also been designed with maximising space in mind. 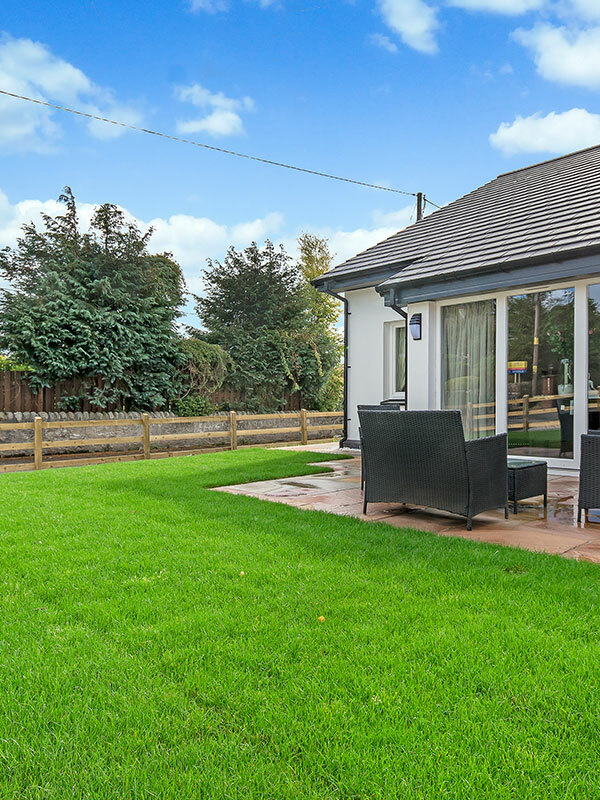 Each property has a private garden and visitor parking along with spacious interiors with the 3 bedroom Kincraig measuring 974 sq ft and the 2 bedroom Moulin measuring 934 sq ft.
With all these eco features as standard, you could say you are future proofing your new home. It’s not just for today, it’s for all those tomorrows too.